Neil Clapperton, CEO of Grampian Housing Association. The low value of the pound, which pundits predict will be on parity with the Euro very soon, is making UK food and drink very attractive indeed. Locally the news just gets better. Whisky, particularly malt, is a bit of a north-east speciality and by lucky chance is the UK’s largest drink export. But wait, with a massive 53% sales surge, salmon has now claimed second spot in the top 10 of the UK’s comestibles sold abroad. What I didn’t realise is that combined with other products like gin, white fish, beef and beer, Scotland is now responsible for half of the UK’s foodie exports. When you think about it, this shouldn’t be a surprise, given the quality of what we produce and our mercantile history, but it does. Over 100 years ago Glasgow, Aberdeen and even lesser industrial towns like Dumbarton were the world’s workshop, selling a cornucopia of things across the globe, albeit mostly inedible: Paisley shawls, trains and steamers and the list goes on. So what has changed and what’s remained the same? “There are few more impressive sights than a Scotsman on the make,” said J.M. Barrie, creator of Peter Pan. My glass half-full interpretation makes that a self-knowing compliment. Making things and trade are some of our species’ most ancient skills, and certainly ones that helped us to dominate the planet. When you think about it, Scotland, being a small country with a point to prove, sited at a global crossroads in trade and communications, and home to amazing riches, doesn’t need an excuse to excel in the ancient and creative arts of manufacture and selling. So what has that to do with the price of fish? Well, I see beautiful and imaginative enterprise across Scotland, but I look at my own sector and see numbing anxiety and a lack of imagination. Anxiety is there because we fear the impact of Universal Credit and continuing austerity, and threats to jobs brought on by digitalisation. Although there are some entrepreneurial souls in the housing association world, there is complacency, and it feels like most of what we do is the same old – same old. What creativity there is fiddles with the edges. I seriously wonder whether we have changed our business model in 100 years. So, in the Scottish tradition of “being on the make”, I think the time has come to take the model to bits and see if the entrepreneur in us can redesign it for the 21st century. 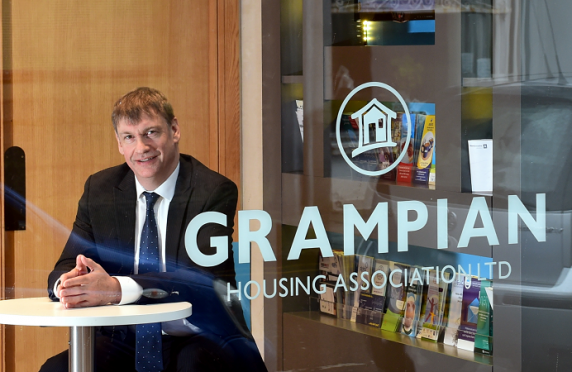 If you have read my earlier blog about moving to a more digital platform, you will know that I want Grampian to be a digital provider of housing services for the majority of our tenants and other customers. It makes absolute sense to enable those that want to get things done 24/7 to be able to do so. This would enable staff to work more efficiently and allow us to concentrate our resources and social skills on the minority that need help. Having chewed over this change to the business I realised a few months ago that I am missing a critical piece.